Emil Guillermo: Will Senate enable Brett Kavanaugh’s bum-rush of the high court? She read it in her opening statement. But the observation was also noted by Rachel Mitchell, the Maricopa County attorney who was hired by the Republican males of the Senate Judiciary Committee to be their prophylactic device. They didn’t like the optics of white men picking apart a woman like Blasey Ford, so they hired Mitchell–to be their human shield. But Mitchell was too sensitive to do the GOP’s dirty work. 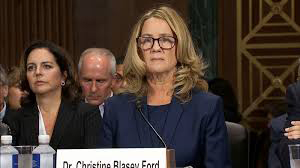 If only the Republicans of the Judiciary Committee had engaged Ford as directly, or simply showed her the respect she deserved. But they were only interested in covering their own political butts. They weren’t interested in Blasey Ford’s well-being, in getting at the truth, or even in making sure the best person gets put on the highest court of the land. It got so bad watching the hearings, during the breaks, I was vehemently punching and kicking my martial arts dummy known as BOB (Body Opponent Bag). BOB knows I’m plenty alpha male enough, but I’m definitely more beta. As Sen. Mazie Hirono might say, I’m probably a more “enlightened male” than not. But that’s only because as an Asian American male, I know what it feels like to be belittled, ignored, or made to act deferential. I know I have my “man card” somewhere, but as an Asian American male, there’s been an historical pattern in America to face a kind of discrimination that finds you feminized, infantilized and emasculated. It takes courage to rise up against that. And that’s a big reason I believed everything Blasey Ford said. Especially when she was asked how certain she was that Brett Kavanaugh was her assailant. “100 percent,” Blasey Ford said. Remember, it’s not a court. It’s a hearing. A job interview. Feelings are as important as facts. With that, there was only one way Kavanaugh could wrest away Blasey Ford’s momentum–to out-victim her. So why didn’t he jump at the opportunity when offered to protect his name by agreeing to an FBI investigation? His answer, implying that the FBI just provided paperwork, was misleading. Even if the FBI doesn’t make a determination, it finds the relevant facts. And if the whole truth and nothing but the truth were really the goal, why not subpoena Mark Judge, the other person said to be in the room with Kavanaugh and Blasey Ford? Have Judge questioned live under oath. It’s a strange process, these judicial hearings. Just a job interview, not a trial? Maybe that’s why the Republicans want to rush things through. They got their man. Why bother with a woman’s details? Meanwhile, Kavanaugh’s partisan pettiness was on full display, villainizing Sen. Feinstein for slow-playing the Blasey Ford card until the last minute. There could have been an FBI investigation, he says, though he doesn’t want one now. Kavanaugh talked about some left-wing conspiracy like the former political operative he was. And then he went snotty and arrogant when asked about his excessive drinking, answering Sen. Amy Klobuchar and others with mocking questions about their own drinking habits. Is this man supreme worthy? One can easily imagine Kavanaugh as a nasty preppy, an entitled drunk, fully capable of doing everything Blasey Ford alleges. So someone is lying under oath. He has too much to lose. And everything to gain. Kavanaugh was clearly playing to Trump, showing the president he can spot Blasey Ford the lead and come back in the last quarter. And when Kavanaugh’s smarminess failed, he had the Nouveau Trumpy Lindsay Graham to pick him up and defend him. It was a throwback to the days before Supreme Court picks got so partisan, when Republicans voted for Democrats and vice versa. Of course, Graham conveniently forgot how the Republicans left a seat open for more than three months and didn’t even give Obama’s SCOTUS pick, Merrick Garland, a hearing. Now that was a sham. And then Mitch McConnell rigged the rules and went nuclear so that Gorsuch could get on the bench. But this is the real Graham, now that his good friend and former conscience Sen. John McCain has died. He then threw Kavanaugh a softball. That was about as ugly as it got. Later, I was surprised to hear people who like Trump love Kavanaugh’s antagonism. Why? He acted like a man, aggressive and snotty. Just like Trump. Blasey Ford? She acted like a woman who had been assaulted, then forced to relive it in front Republican senators who hid behind their prophylactic. Going forward, the best thing would be to delay and get at the truth, including the claims of at least two other women. But something tells me that the bum-rush is on. I detoxed from the hearings by going to a media gathering that night organized by Chinese for Affirmative Action, celebrating 50 years in San Francisco’s Chinatown. Chris Chow, hired as the first Chinese American television reporter in San Francisco TV in 1970, was surprised at how partisan the hearings were. “No one wants to listen to the other side. They just want to score their points and win their elections,” Chow said. I agreed. Who’s trying to find consensus anymore? Everyone has their truth and defends it to the hilt. Let’s hope Blasey Ford’s testimony was not in vain. If Kavanaugh gets on the Supreme Court, community non-profits like AALDEF and CAA, will unfortunately have new life. Instead of moving forward, they’ll be focused on trying to keep society from going backwards in time.